Get to know blogger, artist, and fashion expert Gregory Velvet. When you look up the term “inspiring” in the dictionary, there are key people that just fit the definition flawlessly. Gregory Velvet is one of them. As a fashion editor, influencer, artist, and content partner of Genesis, a brand he “loves because it is all about forging your own path,” he pushes the boundaries on a daily basis (especially when it comes to style) on his wildly-popular website and Instagram feed. To catch a glimpse inside his glittering universe, we caught up with Velvet in honor of the OUT Power 50 issue to learn about his sources of daily inspiration and how he uses the world around him to push himself forward as a true rule breaker. Manifesting your reality and staying “deliriously positive” is the motto Velvet lives by. It’s this mindset, along with his husband that pushes him forward. “My husband is my main source of inspiration,” Velvet shared. “He is the kindest most honest person I know, and that honesty is always a raw source of my inspiration.” Like many, his surroundings and passions also inspire. “I’m also inspired by a million things in my life—my family, The Golden Girls, Bette Davis, Virgina Woolf, travel, Italy, Italian food, Tilda Swinton, the ocean, surfers, Italian business men eating lunch in their perfectly-fitted suits in Italy,” he said. Let’s be honest, we all probably consider one (or all!) of these powerful things important in our own lives as well. 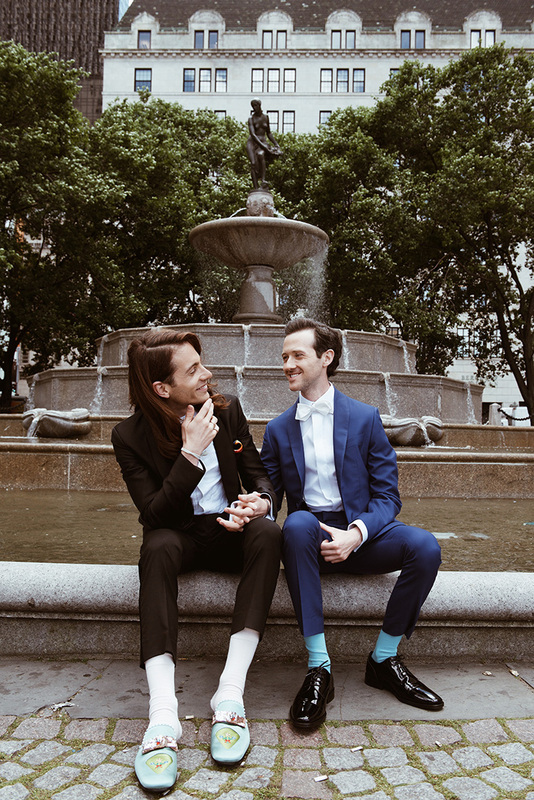 Gregory Velvet and his husband Lorenzo Vinti on their wedding day. Velvet’s determination and courage also comes from three strong female figures in his life—his grandmother, mother, and aunt—the latter two actually worked starting as clerks at the male-dominated The New York Stock Exchange during the late 1970s and 80s. In fact, Velvet credits his mother’s strength and wit she devolved on Wall Street to be a domineering force in raising him to be the man he is today. So how does Velvet plan to use all of these sources of inspo for the future? Well, for one, he aims to sit back and really absorb the world around him. “I feel as though I am always rushing and want to pursue things in a calmer way,” he said. A few of these new pursuits? “I want to travel everywhere, have a baby, and eventually become a daddy blogger,” he said. “I also want to work on creating content and videos that inspire young bloggers to follow their dreams and encourage more people to live a life they love.” Well, if there’s anything we’ve learned from chatting with this powerhouse, it’s that none of these goals seem too out of reach for him. Check out more inspiring stories on style, culinary and lifestyle in this special Power 50: The Road Ahead Series in celebration of the OUT POWER 50 issue.